The Peoples Democratic Party (PDP) in Ekiti State has told President Mohammadu Buhari to return the N1.5 billion of the State money donated to fund his election by former governor of the State, Dr Kayode Fayemi. State Publicity Secretary of the PDP, Jackson Adebayo said in a release issued in Ado-Ekiti on Monday that the N1.5 billion, if returned will go a long way in cushioning the effects of the dwindling economic fortune of the State, especially payment of workers salary. 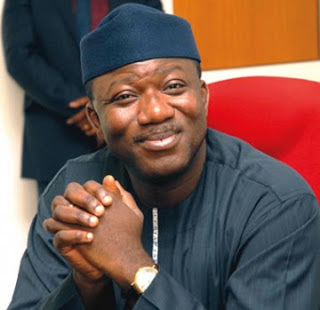 Fayemi, who is now Buhari’s Minister of Solid Minerals reportedly transferred N1.5 billion from his account in a bank located along Liberation Square, Accra, Ghana to the APC Presidential Campaign Fund account “in other to place him in a vantage position for ministerial appointment should Buhari wins the February 14 Presidential election,” and true to his expectation, he was appointed minister. “N1.5 billion is a lot of money and Ekiti State government will only need to add some millions to be able to pay one month salary if Buhari returns the money. “The APC government of Fayemi left office with August and September 2014 salaries of workers unpaid but the same Fayemi could donate N1.5bn to Buhari’s campaign just because he wanted to be minister. Where then is the morality in Buhari’s anti-corruption posture when he was funded with stolen fund? “The President must therefore return the N1.5 billion stolen from Ekiti State that was used to fund his election,” the PDP said.